Netflix has always been known to give their directors and creators a lot of space to breathe and to get weird with their content, unlike most network TV and movie studios. But, with the streaming service's latest show featuring a certain teenage witch and a whole lot of depictions of dark magic, Netflix appears to have invoked the wrath of Satan himself. Well, not literally Satan. The Dark Lord was unavailable for comment at this time. But on Thursday, the famously litigious and political Satanic Temple (not to be confused with the Anton LaVey-founded Church of Satan) hit Netflix with a lawsuit for misrepresenting their teachings, and copyright infringement of their androgynous goat-headed deity Baphomet as seen on Chilling Adventures of Sabrina. They're asking for damages yet to be specified "but believed to exceed $50 million" for copyright damages, and the prompt end of the Netflix series' use of Baphomet in marketing materials and future episodes. Baphomet has been around for a while, closely associated with claims of devil worship against the Knights Templar in the 1300s, but Netflix's depiction of it may have crossed a line for these Satanists. Basically, the lawsuit is claiming the tableau of Baphomet with a male and female child standing on either side -- "Baphomet with Children" -- to be their commissioned depiction of the deity, and theirs only, and for Netflix to have used it in their TV show was a violation of their intellectual property. 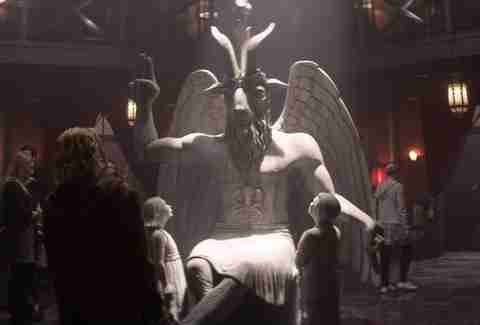 Not only that, the Satanic Temple claims that to use this particular depiction of Baphomet as the centerpiece of a school that houses all the show's evil characters would then, by association, characterize the actual real-life Satanic Temple as an evil organization when their mission, according to the court filing, is "to encourage benevolence and empathy among people rejecting tryannical authority, advocating practical and common-sense justice, and undertaking noble pursuits guided by individual will." So the lawsuit... kind of makes a lot of sense? "While the demographics suggest that the viewership of [American Horror Story, which also had a Satanism storyline this season] and Sabrina likely won't confuse these mockeries of Satanism with our legally recognized iconoclastic religion, I wouldn't be surprised if less sophisticated viewers might take these as somehow being accurate and thereby feel they need to direct hostility towards actual Satanists who are 'out' to society," he worries. Satan is so hot right now, and yet every show that features the devil is steeped in the outdated "Satanic Panic" of the '80s and '90s, he argues. Sabrina's witches worship Satan, yes, but the show still clearly has a very campy, over-the-top version of witchcraft that happens to include things like astral projection and festive cannibalism. Casual viewers probably know that a show like Sabrina is not really a factual portrayal of the occult, but maybe it's time for more responsible depictions of Satanic imagery in our media. Sabrina Season 2, take notes.